Many professionals, in a variety of jobs and organizations, apply progress-focused principles and techniques. Some characteristics of the approach are: 1) focusing on the desired situation, 2) using what is already there, 3) learning from previous successes, 4) taking small steps forward and 5) recognizing and utilizing the perspectives and ideas of the people with whom you work. The collaboration between progress-focused professionals and their clients or customers can be described as collaborative, activating, and supportive. In their way of working, progress-focused professionals support the need for more autonomy, competence and relatedness of their clients/customers. The first advantage of this is that the clients/customers are able to follow their own ideas and find their own solutions with which they can take quick steps forward. They feel that they are the owners of their approach and that their approach fits their situation. This explains why they will feel more motivated and will find it easier to persist. A second advantage of this progress-focused way of working is that the professionals themselves benefit from it. They usually experience the way of working as a pleasant and effective, which contributes to their fulfillment and job satisfaction. When professionals in an organization work in a progress-focused way with their clients/customers, they often find it important that managers and staff members work in way that is congruent with this approach. In other words, they often would like their managers, consultants and policy makers to work with them in a way that is also collaborative, activating and supportive (see picture below). When there is such a congruence between how professionals treat their clients/customers and the way the professionals themselves are treated it will be much easier for them to keep working progress-focused. The congruence shows that management truly believes in this way of working and finds it really important. The reverse is, of course, also the case. A professional who missed this congruence in her work once said to me: "What am I grant my clients is not granted to me by my manager." 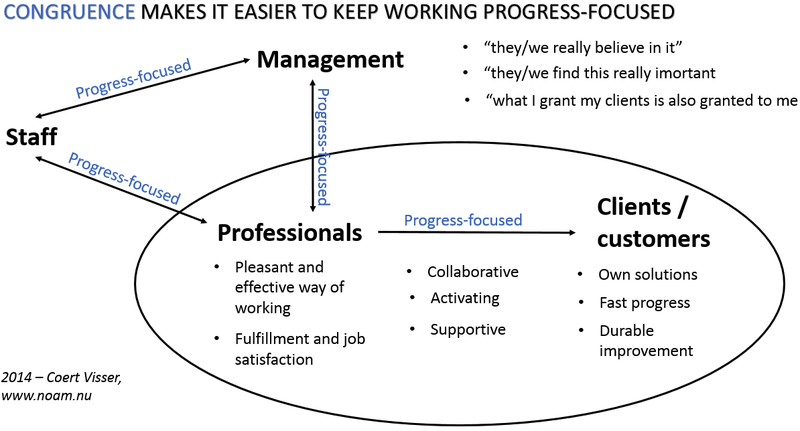 When managers, consultants, policy makers and other members of staff also work progress-focused they can experience the same kinds of benefits as the aforementioned benefits that professionals often experience. They will notice in their conversations with employees that employees will find their own solutions more easily and that they will make faster progress. It is therefore likely that they themselves will also more fulfillment and pleasure in their work.